Like deer caught in the headlights, many central bankers failed to take any action on interest rates this year, despite limp economic and job growth around the world. Of the 74 central bankers in this year’s ratings by Global Finance, 35 left rates unchanged, 26 lowered rates, and 13 raised rates in the first eight months of 2016. The resistance to raising interest rates under current conditions is understandable—no one wants to dampen any nascent recovery—but it illustrates the limits of central bankers’ power. 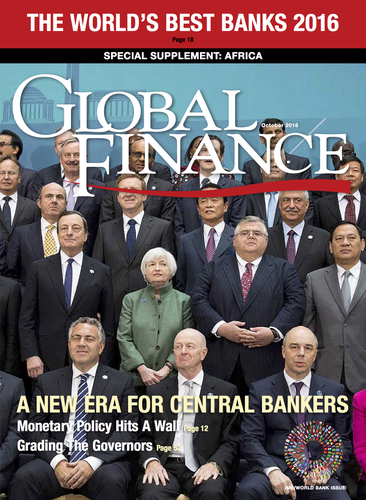 Global Finance has been grading central bankers for 22 years. Our ratings are based on inflation control, economic growth, currency stability and interest-rate management, among other criteria. The determination of central bankers to protect their independence in the face of political pressure and their skills in supervising financial institutions are also taken into account. Of note is the number of rookies in this year’s cohort: 14, compared with just seven last year. While it is too soon to grade the newcomers, we assess the remaining governors on an A to F scale. The wide range of grades shows that some central bankers are doing better than others at keeping their economies healthy in the current low-growth, low-interest-rate environment. Undershooting inflation targets has become the global norm for central banks, Michael Hanson, senior global economist at Bank of America Merrill Lynch Global Research, noted in a recent report. Markets are skeptical that central banks will meet their inflation targets and are therefore pricing in continued below-target inflation, he says. “We disagree [with the market]. The case for permanently low inflation is mixed at best, and policy makers still have some effective tools,” Hanson says. “Cooperation from fiscal policy would be helpful, but we view ‘helicopter money’ as both unnecessary and impractical.” “Helicopter money” refers to large amounts of new money printed and distributed to the public to stimulate economic growth. Investing in infrastructure projects that boost productivity is one way that fiscal policy could help to get world economies back on track, Hanson says. He believes central banks around the world still have the means to push inflation rates back up. Janet Yellen, chair of the board of governors of the Federal Reserve System, says the US central bank has significantly expanded its monetary policy toolkit to address the challenges posed by the global financial crisis and the subsequent severe recession and slow recovery. In 2011, for example, the Fed began paying interest on banks’ reserve balances. “This allows the Fed to control short-term interest rates when reserves are plentiful,” Yellen said, in an address during the Kansas City Fed’s annual symposium, which took place in Jackson Hole, Wyoming, in late August. “Two other major additions to the Fed’s toolkit were large-scale asset purchases and increasingly explicit forward guidance,” Yellen said, suggesting policymakers may wish to explore the possibility of purchasing a broader range of assets to respond to future economic downturns. Yellen says some observers have suggested raising the Fed’s 2% inflation target or implementing monetary policy through price-level or nominal GDP targeting. Although these are important topics for research, the Fed is not actively considering them, she says. “Even if average interest rates remain lower than in the past, I believe that monetary policy will, under most conditions, be able to respond effectively,” Yellen says. Stanley Fischer, the Fed’s vice chair, says the US central bank has actually come close to meeting its targets of maximum employment and 2% inflation. Employment has been “remarkably resilient,” and the Fed’s preferred measure of core prices is at 1.6%, “within hailing distance of 2%,” Fischer told the Aspen Institute in Colorado in August. The European Central Bank introduced a stimulus program in June 2014, when the inflation rate was 0.5%. It took more steps in March 2016, including the purchase of corporate bonds, but inflation for this year is forecast at a mere 0.2% in the European Union. Meanwhile, some major oil-producing countries, including Angola, Azerbaijan and Nigeria, raised rates to prop up their currencies, as hydrocarbon revenues remained low. Others, with currencies linked to the dollar, had little room to maneuver on monetary policy.